Depression glass was produced in the United States in the 1920s through the 1940s. Decorative glassware such as plates, glasses, decanters, salt and pepper shaker sets, goblets, candlesticks and bowls are common pieces that were produced during the Depression era. The pieces were sold at a reasonable price and were designed to enhance dining tables. Pieces were often given away as promotions at banks, department stores and grocery stores. The glassware can be identified by the color, pattern and style. Identify your piece based on color and pattern. Observe the color of the glassware. Most Depression glassware was produced in shades of green, pink, amber, cobalt, red and yellow. Distinctive patterns were used on Depression glass. Hobnail, which consists of raised bumps, embossed swirls and flowers, are examples of common patterns. Refer to a guide that provides pictures and detail descriptions of specific patterns of glassware. The website First Glass Class recommends the books "The Collector's Encyclopedia of Depression Glass" and "Elegant Glassware of the Depression Era," both by Gene Florence. With hundreds of types and styles, a picture reference is your best resource. 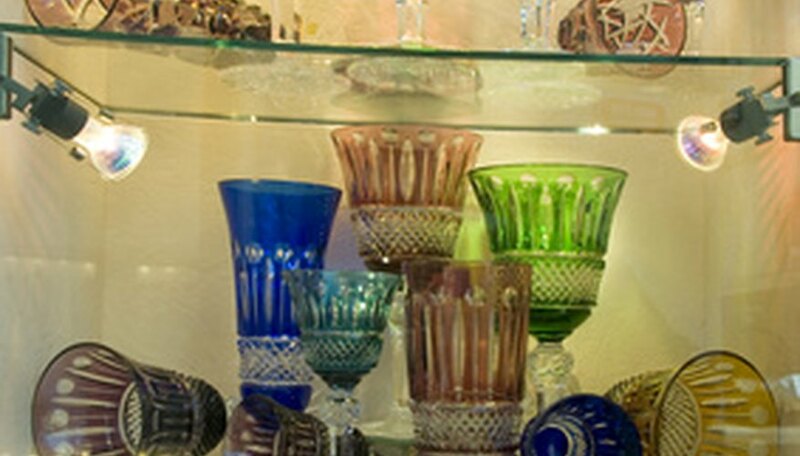 Consult with an antique dealer specializing in depression glass. The dealer can help you to identify the pattern name, manufacturer and approximate age of your piece. Johanna Miller has been writing professionally since 2010. She has been published in various online publications. Miller holds an Associate of Business degree with a concentration in accounting from Stark State College. How Do You Tell an Old Fostoria American Pattern From a New One?